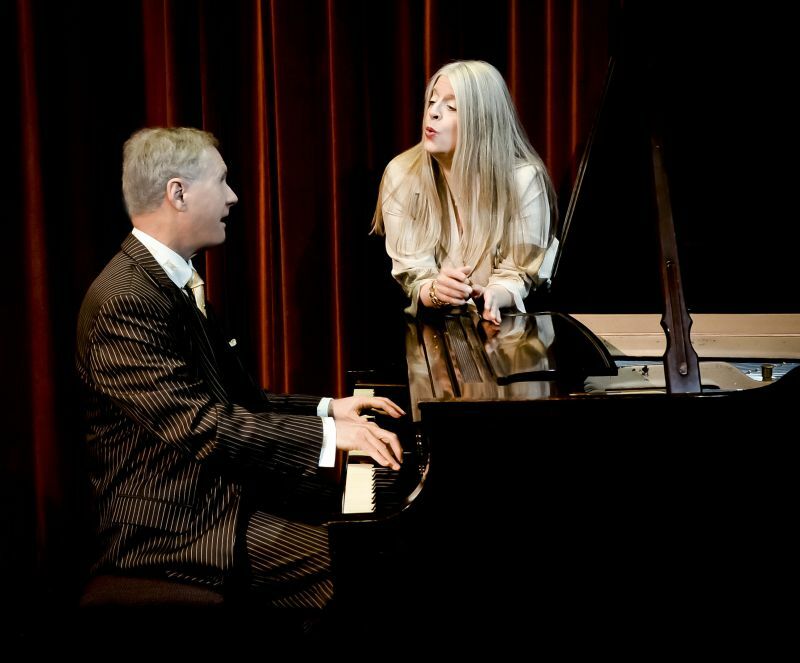 With a show entitled My Blue Heaven, which is also the title of their new CD, Saugerties Pro Musica is proud to present Terry Blaine and Mark Shane in a return to their duo roots as Swingtime Duet. My Blue Heaven pays homage to the marvelous treasure trove of music from America’s Golden Age of Swing. Together they create an irresistible duet. Songs include My Blue Heaven, Ain’t He Sweet, Honeysuckle Rose, Melancholy Baby, and Come Up and See Me Sometime; beloved singers such as Ethel Waters, Billie Holiday, Annette Hanshaw, Mildred Bailey, Peggy Lee and Mae West are showcased; and the great Harlem-style piano tradition born with James P. Johnson, Fats Waller, Teddy Wilson, Art Tatum and Earl Hines shines on. Jazz singer Terry Blaine has been singing virtually all her life. She has enjoyed a multi-faceted career that includes live performance, TV/radio, recordings, studio work, songwriting, production, and music therapy. She gained international attention and recognition as one of today’s finest interpreters of hot small-band swing from the 1930s. Terry’s singing is a gentle, swinging reminder of where we came from, instilled with a spirit that only genuine affection can inspire. Mark Shane’s piano, featured in the hit HBO series Boardwalk Empire, adds a distinctive new voice to the tradition of hot ensemble playing. His jazz piano has also been featured on film soundtracks, including The Cotton Club, Brighton Beach Memoirs, Biloxi Blues, and Working Girl. Mark’s piano reflects a true sense of living jazz history, and continues the Classic Jazz Piano tradition that is one of America’s unique contributions to world culture. Future Saugerties Pro Musica concerts include the winner of the 2014 Bard Conservatory Concerto Competition, violinist Gabriel Baeza on November 9th, pianist Thomas Pandolfi on March 29th, 2015, saxophonist Ashu on April 19th, 2015, and the Hyperion Quartet on May 17th, 2015. Of course, the perennial favorites – Strawberry Hill Fiddlers – will return January 25th, 2015, but our traditional free concert by a West Point Ensemble has been cancelled, to be replaced this year with classical pianist Yalin Chi on February 22nd, 2015. Tickets for all concerts are $12 for Adults, $10 for Seniors, and all Students are always free. This entry was posted in Saugerties Pro Musica, Uncategorized and tagged American Standards, Jazz, music concert, Saugerties Pro Musica. Bookmark the permalink.